- Sealing speed: 1200 Bottles / hr. 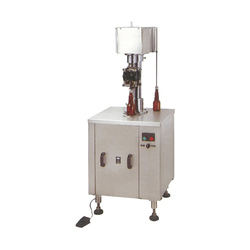 We offer a wide range of Fully Automatic ROPP Cap Sealing Machines that is used to seal caps on bottles. These machines can seal metallic's caps, plastic screw caps of various sizes on the bottles fed on continuous line. We are the leading manufatcurer and supplier of Aurae III C Induction Cap Sealing.They are fabricated under the supervision of skilled engineers and technicians at our ultramodern infrastructure facility. : The filled bottel moving on conveyer belt. Output: 2400 to 3600 bottles per hour. 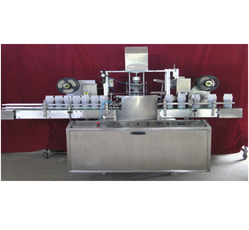 We have the expertise to manufacture a wide array of Automatic Aluminum Vial Cap Sealing Machine. These products have such a high demand in the market owing to its capability to protect products from external elements and also retain product quality to increase the storage life. • Main Features of Capping Machine -“No Container - No Cap arrangement". • Online / Offline Operation can Possible. Security capseals assure maximum protection for drummed products. Steel security capseals are made of quality tin plated stel which is precisely formed, lined with a chemical resistant lacquer and fitted with a heat cured vinyl gasket.